"A" isn't just for "apple" anymore. In pretty much every country across the board, learning the alphabet - or whatever writing system one uses in one's native language - is the first thing one does when learning to read (because, let's face it, it'd be kinda hard to do otherwise). Given that you're reading this post in English, it's a safe bet that you, at some point, studied the alphabet. Perhaps you used a traditional model like "A is for Apple and B is for Boy," or perhaps you used something slightly more modernized and up-to-date. I think we probably all wish we'd learned the alphabet with a graphic like this, though. 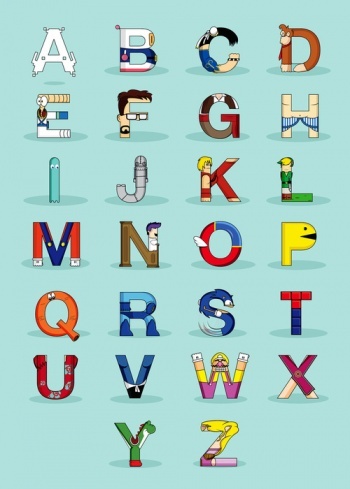 Artist Fabian Gonzalez likes creating versions of the alphabet - he's made one for characters on The Simpsons and various superheroes - and a videogame version of the same was long overdue. Most of these are pretty obvious - C is for Chun-Li, L is for Link, and so on. Others are tougher: I'm personally stumped on N, U, and V, and I'm not entirely sure my guess for X is correct (I'm thinking Xianghua from Soul Calibur). Also, the "R" here is totally cheating. How many can you name on a first try? For those among us who want to combine our love for videogames and our love for the alphabet in wearable form, you can order this as a print or a T-shirt right here.